Prior to announcing the release of his new album, Coup de Grace, Miles Kane teamed up with Muse singer and guitarist Matt Bellamy, Nine Inch Nails guitarist Ilan Rubin, and Zutons drummer Sean Payne to sing in Beatles tribute band named Dr. Pepper's Jaded Hearts Club Band. It was another side project for the former frontman of the Rascals, who more succesfully co-founded the Last Shadow Puppets, with Arctic Monkeys' singer, Alex Turner. He's best known as a solo artist with two successful albums in his own right, and Kane's third blistering exercise in modern rock 'n' roll, Coup De Grace, is a ten-track opus filled with a contagious enthusiasm. 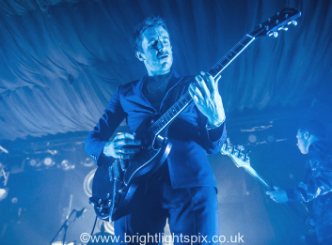 Following an intimate UK club tour, including a gig at Concorde 2, in Brighton, with his new band, Miles has been previewing several album tracks including Loaded written by Miles, Lana Del Rey and Jamie T; the T Rex inspired current single Cry On My Guitar and the catchy Too Little Too Late. Since joining The Little Flames fourteen years ago, Miles has seen the pop climate change considerably but still believes the magic's in the music. He's like an excitable schoolboy who just went to his first gig. His enthusiasm is contagious. "For me to really love someone, I have to want to be them," he enthuses. "You want to look the way they look, move the way they move. To me, going to my first gigs, it was always otherworldly: how do I get there?" Coup De Grace, is Miles' first solo album since 2013's Don"t Forget Who You Are, and well worth the wait. Recorded in LA, produced by John Congleton (St. Vincent), Miles wrote much of the album with Jamie T.
"This record for me is the most important record I've made to date," said Miles. "It's been five years in the making, a lot of emotion and excitement has gone into making this album!"